CDepot is a brick and mortar business which has been serving the suburban Maryland area public for over ten years. 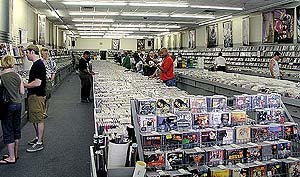 We are the largest independent CD store in the Mid-Atlantic region with well over 100,000 discs and thousands of DVDs. The College Park location features a giant 8,000 square feet show room, which we fill to the brim with CDs, DVDs, Video Games, Posters, Box Sets, Listening Stations and much more. This location is conveniently located between the Washington Beltway and the University of Maryland College Park Campus. Likewise, the Towson store is situated on a 6,000 square feet location with the same features as the flagship. Located just off of the Baltimore Beltway, this store offers the same high quality merchandise and features that our customers have come to expect from CDepot. Two important reasons for our popularity are that we buy and sell used CDs/DVDs/Games, and that we have extremely low prices. The formula is simple: we pay CASH for CDs/DVDs/Games, and then turn around and sell them at reduced prices to others. Because we ONLY sell merchandise that is in mint condition, we guarantee that your purchases will play correctly. And by buying used CDs we often come across rare and out of print CDs which standard retail stores cannot offer. Just a small selection of our massive inventory. Our shelves are restocked constantly by our friendly and professional staff. We try to be as helpful as possible so you can find the title that you are looking for... even if you aren't quite sure what it is. We happily accept Visa, MasterCard, and Discover and Debit transactions. We can not currently accept American Express. The Towson location accepts checks.